Figure 7. 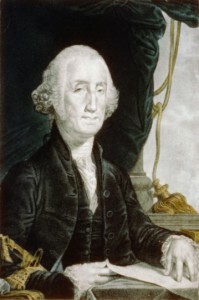 Painting of George Washington, president of the United States from 1789 – 1797. Courtesy of Natural Concepts. The Constitution went into effect in March of 1789 without the approval of North Carolina and Rhode Island. But, in November of 1789, delegates of a second convention, including John Sevier, in North Carolina ratified the Constitution only after the addition of the Bill of Rights. With ratification, North Carolina became the 12th state to join the Union. In December of 1789, the North Carolina legislature ceded the state’s western territory (present-day Tennessee) to the new federal government for the second time. Congress accepted the cession bill, and in May of 1790, Congress created the Territory South of the River Ohio or commonly known as the Southwest Territory. The next month, President George Washington appointed William Blount of North Carolina as governor of the new territory. Figure 8. United States map of 1790 showing the Southwest Territory. Courtesy of Natural Concepts. 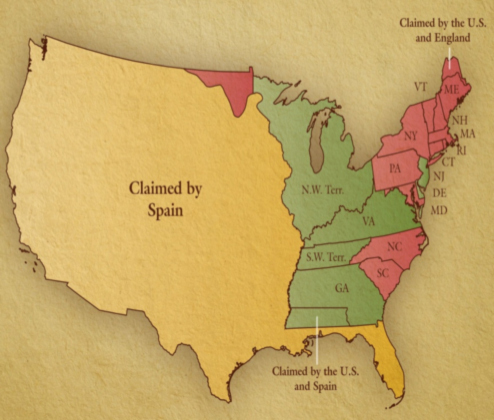 The Southwest Territory was to be governed under the provisions of the Ordinance of 1787 (the Northwest Ordinance), which provided that a territory would pass through stages before being admitted to statehood. Initially, an appointed governor, territorial secretary, and territorial judges would govern the territory. When the adult male population reached five thousand, the territory could form a house of representatives. That body of representatives, along with the governor, and a five-man legislative council would constitute a territorial legislature. When the territorial population reached sixty thousand, the territory could then draft a state constitution and apply for statehood. The residents of the territory were guaranteed certain rights, including freedom of religion and trial by jury. The Ordinance of 1787 outlawed slavery in the Northwest Territory, but in the Southwest Territory slavery was legal. In October of 1793, Governor Blount called for the election of a territorial house of representatives. Colonel John Tipton and Leroy Taylor represented Washington County. Meeting in Knoxville in 1794 and 1795, the territorial assembly chose a delegate to represent the territory in the U.S. Congress, created a system of taxation, provided for the administration of justice in the territory, and established a treasury department. The assembly also established colleges, created new counties, and chartered new towns throughout the territory. In June of 1795, the assembly directed that a territorial census be held in the fall, along with a poll of all free males (age eighteen and older) on the question of statehood for the territory. The census revealed that more than seventy-five thousand people resided in the territory, and a large majority of those who voted in the poll favored statehood for the territory. Consequently, the governor authorized the election of five delegates from each county in the territory, who met in January of 1796 to form a government for the proposed new state. Colonel John Tipton and four other men represented Washington County in the January constitutional convention. That month, Colonel Tipton and his fellow delegates assembled in Knoxville “for the purpose of forming a Constitution, or form of Government, for the permanent government of the people….” Colonel Tipton was appointed to a committee given the responsibility of drafting a constitution and bill of rights for the prospective state. The constitution drafted in Knoxville was later described by Thomas Jefferson as “the least imperfect and most republican” of the state constitutions. Modeled in large part after the constitutions of North Carolina and Pennsylvania, the state’s first constitution provided for a bicameral legislature, a popularly-elected governor, and a system of courts to be created by the legislature. The Constitution of 1796 gave voting rights to all free adult males (including free blacks) who were at least twenty-one years old. The bill of rights guaranteed freedom of speech, religion, press, peaceable assembly, trial by jury, and security against unjustifiable search and seizure. The name of the proposed state would be Tennessee. The delegates chose not to submit the constitution to popular referendum, but a copy of the document was hastily sent to the U.S. Congress in Philadelphia. The first session of the Tennessee legislature met at Knoxville in March of 1796. During this session, Colonel John Tipton represented Washington County in the state senate. The primary accomplishment of this first legislature was implementing the new state government. The legislators certified the election of the ever-popular John Sevier as the state’s first governor, elected two United States senators, and created four new counties. In the meantime, President George Washington submitted the state constitution to Congress. At this time the House of Representatives was controlled by the Republican Party (Democratic-Republicans) who favored statehood for Tennessee. The Senate was dominated by Federalists who opposed the possible statehood of Tennessee. After much debate in the Senate, the House and Senate created a joint committee to consider the statehood question. The committee approved statehood, both houses of Congress accepted the committee report, and Tennessee became the 16th state of the Union on June 1, 1796. The Constitution of 1796 remained in effect for nearly forty years. However, at the state’s second constitutional convention held in Nashville in 1834, elected delegates made major revisions to the state constitution. One significant revision considered by the delegates was voting rights. The Constitution of 1796 granted voting rights to all free males (regardless of color), but the new constitution permitted only free white men to vote. Black males were not able to vote until 1870, while women were not eligible to vote until 1920. Figure 9. 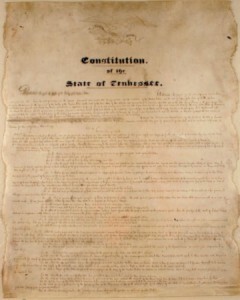 The second constitution of the State of Tennessee. Courtesy of Natural Concepts. 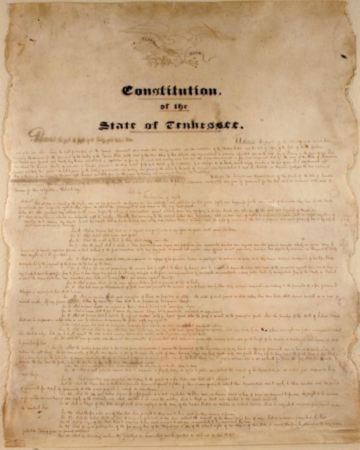 Other issues were addressed and revised during the second constitutional convention and Tennessee’s second constitution went into effect after being approved by the voters in a popular referendum in March of 1835. Edward T. Sanford, “The Constitutional Convention of 1796,” in Proceedings of the Annual Session of the Bar Association of Tennessee (Nashville, Tennessee: Marshall & Bruce Co., Printers and Stationers, 1896), 97. J. G. M. Ramsey, The Annals of Tennessee, (1853; repr., Kingsport, Tennessee: Kingsport Press, Inc., 1967), 657. Tennessee Constitutional Convention, Journal of the Convention of the State of Tennessee: Convened for the Purpose of Revising and Amending the Constitution Thereof (Nashville, Tennessee: W. H. Hunt and co., printers, 1834), 88. Abernethy, Thomas Perkins. From Frontier to Plantation in Tennessee: A Study in Frontier Democracy. 1932. Reprint, Tuscaloosa, University of Alabama, 1967. Alderman, Pat. The Overmountain Men. 1970. Johnson City, Tennessee: The Overmountain Press, 1986. Corlew, Robert E. Tennessee: A Short History. 2nd ed. Knoxville: The University of Tennessee Press, 1981. Indiana Historical Bureau. “Northwest Ordinance of 1787.” http://www.in.gov/history/2695.htm (accessed August 2010). Library of Congress. “Documents from the Continental Congress and the Constitutional Convention, 1774-1789.” http://memory.loc.gov/cgi-bin/query/r?ammem/bdsdcc:@field (DOCID+@lit(bdsdcc13401)) (accessed August 2010). ­­­­­_______________. “Northwest Ordinance.” http://www.loc.gov/rr/program/bib/ourdocs/ northwest.html (accessed August 2010). Our Documents. “Northwest Ordinance (1787).” http://ourdocuments.gov/doc.php? flash=true&doc=8 (accessed August 2010). Ramsey, J. G. M. The Annals of Tennessee. 1853. Reprint, Kingsport, Tennessee: Kingsport Press, Inc., 1967. Sanford, Edward T. “The Constitutional Convention of 1796.” In Proceedings of the Annual Session of the Bar Association of Tennessee, 92-135. Nashville, Tennessee: Marshall & Bruce Co., Printers and Stationers, 1896. Speer, Ed. “Constitutions.” In The Tennessee Handbook, 45-83. Jefferson, North Carolina: McFarland & Company, Inc., Publishers, 2002. Tennessee Constitutional Convention. Journal of the Convention of the State of Tennessee: Convened for the Purpose of Revising and Amending the Constitution Thereof. Nashville, Tennessee: W. H. Hunt and co., printers, 1834.